If you’re an industrial engineer, you need to learn how to manufacture a strong resume. Start by using this sample as a foundation. If you're on the lookout for top industrial engineer jobs, you first must learn how to manufacture a strong resume that will attract the attention of hiring managers. 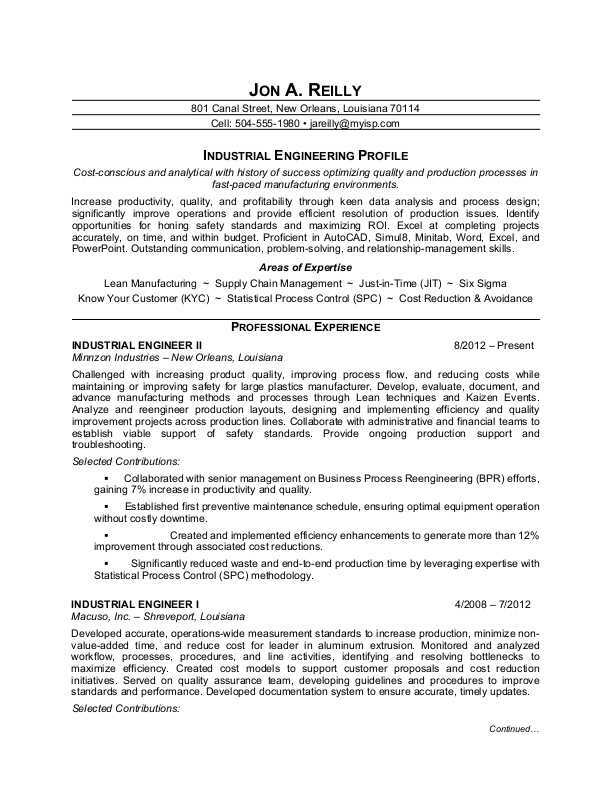 For inspiration, use our sample resume for an industrial engineer below as a foundation, and download the sample resume for an industrial engineer in Word. Jobs for industrial engineers are projected to grow by 10% (or 25,100 jobs) from 2016 through 2026, which is faster than average, according to the Bureau of Labor Statistics (BLS). You'll find the highest level of employment for this job in the following states: Michigan, California, Texas, Ohio, and Illinois; and in the following metropolitan areas: Warren, MI; Minneapolis; Los Angeles, Chicago; and Detroit. As an industrial engineer, you can expect to earn a median wage of $85,880 per year, or $41.29 per hour, according to the BLS. Additionally, you can learn more about engineering careers and search for industrial engineering jobs on Monster. Cost-conscious and analytical with history of success optimizing quality and production processes in fast-paced manufacturing environments. Increase productivity, quality, and profitability through keen data analysis and process design; significantly improve operations and provide efficient resolution of production issues. Identify opportunities for honing safety standards and maximizing ROI. Excel at completing projects accurately, on time, and within budget. Proficient in AutoCAD, Simul8, Minitab, Word, Excel, and PowerPoint. Outstanding communication, problem-solving, and relationship-management skills. Challenged with increasing product quality, improving process flow, and reducing costs while maintaining or improving safety for large plastics manufacturer. Develop, evaluate, document, and advance manufacturing methods and processes through Lean techniques and Kaizen Events. Analyze and reengineer production layouts, designing and implementing efficiency and quality improvement projects across production lines. Collaborate with administrative and financial teams to establish viable support of safety standards. Provide ongoing production support and troubleshooting. Collaborated with senior management on Business Process Reengineering (BPR) efforts, gaining 7% increase in productivity and quality. Established first preventive maintenance schedule, ensuring optimal equipment operation without costly downtime. Created and implemented efficiency enhancements to generate more than 12% improvement through associated cost reductions. Significantly reduced waste and end-to-end production time by leveraging expertise with Statistical Process Control (SPC) methodology. Developed accurate, operations-wide measurement standards to increase production, minimize non-value-added time, and reduce cost for leader in aluminum extrusion. Monitored and analyzed workflow, processes, procedures, and line activities, identifying and resolving bottlenecks to maximize efficiency. Created cost models to support customer proposals and cost reduction initiatives. Served on quality assurance team, developing guidelines and procedures to improve standards and performance. Developed documentation system to ensure accurate, timely updates. Implemented Just-in-Time (JIT) strategy to optimize throughput and lower warehouse costs by as much as 17%. Redesigned floor layout, achieving 10% improvement in overall productivity while reducing required manpower by 4%. Integrated quickly into six-person team tasked with investigating, recommending, planning, and implementing optimization processes in manufacture of fire-retardant clothing. Provided operation expertise and Lean manufacturing strategies to increase ROI and enhance throughput. Consulted with manufacturing team to identify best practices for safety and supply chain operations. Completed comprehensive time study project three weeks ahead of schedule. Identified and proposed optimization affecting three manufacturing lines. As an industrial engineer, you're used to observing production processes and determining how to make them better and more efficient. Looking to do the same for your resume? Get a free resume evaluation today from the experts at Monster's Resume Writing Service. You'll get detailed feedback in two business days, including a review of your resume's appearance and content, and a prediction of a recruiter's first impression. It's a quick and easy way to make sure you're going into a job search with your most professional foot forward.